TJ's has compiled the Elite St Esprit fence panels in a pack form for your convenience. 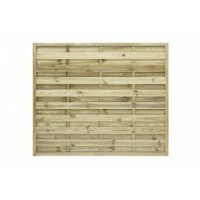 The fence panels are made from square slats and are secured in a rebate frame to create a stylish fence panel. These fence panels are made from selected FSC timbers and are manufactured to a high standard, planed and pressure treated with a pale green finish which allows the true colour of the timber to show through. Covering an area of 19ft the pressure treated St Esprit fencing pack @ 1.8m high consists .. Covering an area of 25ft 3” the pressure treated St Esprit fencing pack @ 1.8m high consis.. Covering an area of 31ft 6" the pressure treated St Esprit fencing pack @ 1.8m high consis.. Covering an area of 37ft 9" the pressure treated St Esprit fencing pack @ 1.8m high consis.. Covering an area of 44ft the pressure treated St Esprit fencing pack @ 1.8m high consists .. Covering an area of 50ft 3" the pressure treated St Esprit fencing pack @ 1.8m high consis.. Covering an area of 56ft 6" the pressure treated St Esprit fencing pack @ 1.8m high consis.. Covering an area of 62ft 9" the pressure treated St Esprit fencing pack @ 1.8m high consis..